Satori is a 41.5m schooner, launched in 2017 but capturing the elegance and style of the 1920s and 30s. Pianosa Island. Picture courtesy of Shutterstock.com / robertonencini. 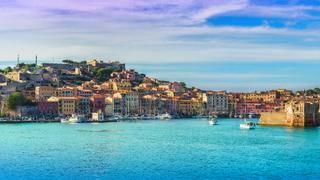 Old town and harbour or Portoferraio, Elba island, Italy. Picture courtesy of Shutterstock.com / Balate Dorin. Andrea Mattei, right, is the head chef at Meo Modo, the Michelin starred restaurant at Borgo Santo Pietro. He regularly cooks on board Satori. On the screen, Juliette Binoche is stirring chocolat. As I lie back on a daybed, Andrea Mattei offers me warm popcorn he’s just prepared (a task this Michelin starred chef is rather overqualified for). Our outdoor cinema is tonight located in a sheltered cove north of Portoferraio, on the Italian island of Elba, with the screen rigged up between mast stays at the bow of Satori. In the morning light the next day, the backdrop is fully — a tall cliff, made of granite once quarried for columns in the Colosseum in Rome. Before breakfast the stern swim platform unfolds from the transom allowing me to dive into the turquoise Tyrrhenian Sea and fully appreciate the sleek proportions of this 41.5 metre schooner. 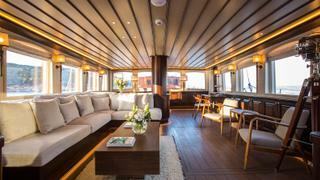 Satori was launched in early 2017 by Claus and Jeanette Thottrup but she has been designed with far more than just exterior aesthetics in mind. Her Danish creators also run the exquisite five-star Tuscan hotel Borgo Santo Pietro, one of the best hotels in the Mediterranean, and the ethos behind her build was to reproduce “a boutique hotel and gourmet dining concept” at sea. 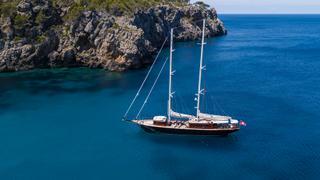 Claus and Jeanette are understandably proud of Satori, which they built in Bodrum — to RINA commercial yacht standards (and occasionally beyond – the windows contain 42mm laminated — eventually purchasing the shipyard to complete the project. On board, the Thottrups’ attention to detail is evident throughout, from her free-standing walnut bath in the master cabin to a cellar hidden underneath the stairs. As enthusiastic adoptive Tuscans, the Thottrups also believe they know the perfect region for Satori to provide the most relaxing or energising environment for a holiday. 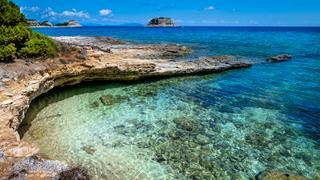 They have decided to limit Satori’s range to the Côte d’Azur and the west coast of Italy. But Claus goes further. “I would recommend embarking at Scarlino, [Nautor’s Swan owner] Leonardo Ferragamo’s marina at Follonica, which is 90 minutes from Pisa airport. Follonica Marina is also handily located less than an hour’s drive from Borgo Santo Pietro, if you wish to top or tail your time on board. 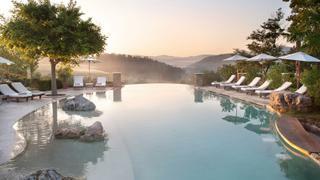 Nestled in the Tuscan hills, its beautiful villas and rooms are enhanced by 13 acres of gardens and a 200-acre estate with organic pasture, olive groves and vineyards. Paths meander between the organic vegetable plots, herb gardens, orchards and berry bushes. Everywhere you walk, you encounter secret spots set up for open air seclusion — a day bed overlooking an enticingly paintable pond, a secluded rose courtyard with a table, a reading nook surrounded by fragrant rosemary and lavender, a couple of seats perfectly positioned for a vista of the Valle Serena. Aboard Satori, this principle has been taken to sea, creating numerous spaces that can be as communal or private as you like. Satori feels like a tasteful home of the 1930s, with sepia-tinted Turkish marble, black and white photographs of Greek fishermen reprinted from the National Archives in Athens, Pieter Adam lights and natural fabrics such as Pierre Frey linen. For ultimate relaxation one of the five cabins can be used as a superyacht spa, with a masseuse from Borgo Santo Pietro using Seed to Skin products — a range due to be launched commercially later in 2017, developed by Jeanette with a pharmacist, using natural ingredients such as honey and sheep’s milk from the Borgo estate. As enticing as Satori is, this quiet corner of Elba — where Napoléon Bonaparte was famously exiled in 1814 — deserves to be explored. The north coast has a plethora of sheltered anchorages by remote beaches or with views up to the 1,000 metre peak of Monte Capanne — perfect settings for making your own beach club. Satori is not short of water toys as she boasts three sea kayaks, an Optimist dinghy, two Yamaha Superjets, a pair of Cayago F5S SeaBobs, and a wakeboard or water skis, which can be towed by the powerful Williams jet tender. We decide to use the tender for a more sedate journey into the old harbour of Portoferraio. The curved dock oozes Italian charm, with its ancient bastions and fishermen selling sardines on the streets (although the town can be a bit of a squeeze, with tourists pouring from passing ferries). We climb the higgledy-piggledy roads to reach the butter yellow house where Napoléon lived in some comfort during his stint on the island. His favourite part of the Palazzina dei Mulini was reportedly its formal garden, which offered stunning views of the sparkling sea below. He didn’t appreciate it for long, however, as he escaped within a year to regain the French crown. For those with a more active disposition, Elba’s other attractions include walking or cycling (Satori has four Gocycle G3 electric bikes on board) in the national park. A two hour hike will get you to Elba’s highest peak — Monte Capanne — offering panoramic views of the mainland of Italy and the islands of Corsica, Capraia, Pianosa and Montecristo (there is also a cable car option). Additionally, the five-star Hotel Hermitage offers windsurfing, a golf course and tennis courts. 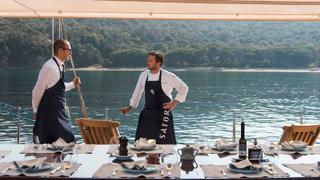 During my time on board, Mattei and Sardi produce superlative dishes. First Sardi serves ricciola (amberjack) lightly cooked with beetroot in different forms — cream, gel, dust. The next day, Mattei serves his version marinated (also in beetroot), with almond and apple. The greatest rivalry (all friendly, though) comes with risotto: Sardi’s rice with goat’s curd and garden peas versus Mattei’s asparagus risotto with an incredible spray of liquorice over the surface. These rice dishes are a hint that charter clients are not committed to a six-course tasting menu every night. This is also the case at Borgo, where the Trattoria Sull’Albero serves salads, grills, pizzas and pasta in a casual restaurant built around the trunk of a huge oak tree (a little like the mast emerging from the bar of Satori). Part of the experience, both on Satori and back at Borgo, is not just eating exquisite food but also interacting with it. On board Satori the galley is in a prominent position so it can be used to host a sea-going cookery school. Back on land, I spend a morning in an open sided, converted farm building, La Borgo Scuola di Cucina, under the tutelage of Mamma Olga, a nonna from Cinecittà Central Casting — diminutive, busy and just the right balance of stern and encouraging. She has us making pasta dough from scratch and filling ravioli with spinach and ricotta. 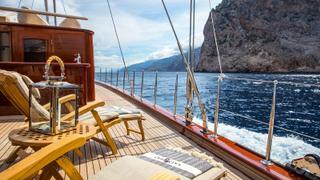 Afterwards, we eat outside on a long bench — a more rustic version of the mahogany table aboard Satori. The similarities between the Thottrups’ assets stretch far beyond furnishings. It is the touch of Danish hygge combined with Italian aria di casa that has been successfully transferred from land to sea. 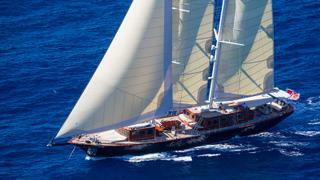 Satori is managed for charterbyBurgessand has a weekly rate starting from €77,000.